A basic Spaghetti Western, Adiós, Sabata (also known as Indio Black and The Bounty Hunters) throws together all the typical ingredients and produces a most predictable rehash. Yul Brynner's presence helps to generate a few precious highlights amidst the prevailing dross. Mexico is being oppressed by foreign Austrian rulers commanded by the ruthless Colonel Skimmel (Gerard Herter). A peasant revolution is about to be crushed, but a last-ditch attempt is organized by the rebel leaders to steal a gold shipment and use it to trade for weapons to turn the tide of the revolution. Rebel leader Escudo (Ignazio Spalla) forms an unlikely alliance with bounty hunter and expert shot Sabata (Brynner) and smooth-talking aristocrat artist Ballantine (Dean Reed) to try and pull off the mission, but the scrappy outlaws have to guard against personal greed and each other as much as the Austrian army. Directed by Gianfranco Parolini, Adiós, Sabata tramples around familiar territory, feeding from scraps of Spaghetti Western plot points seen many times before, and creating a generally poor smorgasbord. The film moves from one set-piece to another, never pausing to invest in plot and character. It's all noisy, frantic and mindless, and none of it resonates. Faceless, undefined Austrians in suits and top hats engage in firefights with faceless, undefined peasants. Bodies drop dead by the hundreds. A wagon purportedly carrying gold is the target of a wild shoot out, a bridge is targeted for destruction by dynamite, a garrison is stormed. Numerous Gattling guns are brought into numerous battles only to be summarily destroyed by the heroes. The outcome is a disjointed, almost superfluous plot that borders on unintentionally comical. The typical below-average production values and hit-and-miss editing don't help. The better elements, and there are a few, are brought together by a confident Yul Brynner performance. He does not say much and breezes through the movie in a fetching black outfit revealing too much chest. He also carries a cool tricked-out shotgun with a harmonica-style side-loading magazine. Sabata of course never misses a shot no matter what the distance, and is never even as much as grazed by any bullets either. The main theme music by Bruno Nicolai is borrowed from various Morricone gems, but is anyway above average. 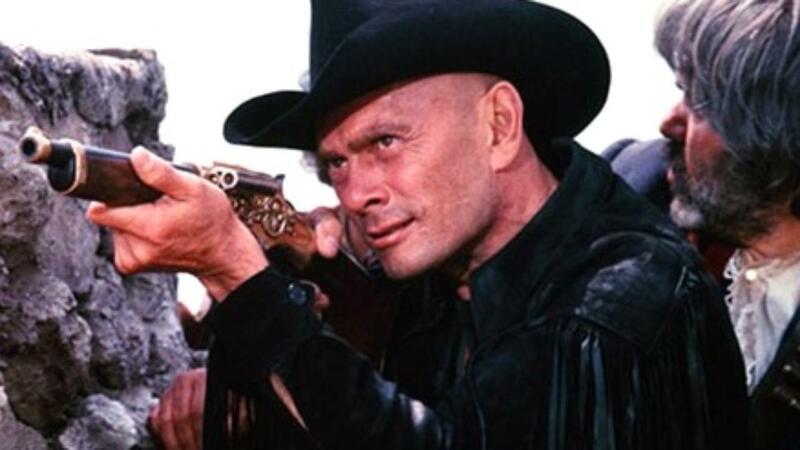 But Brynner and his shotgun alone cannot save the film. Adiós, Sabata is predictable, mechanical and quite unnecessary.